Breeze on in to the relaxed flow of this Wellington getaway. 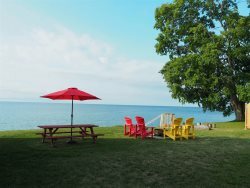 Set back from the water with stunning views of Lake Ontario and a massive yard for the kids to enjoy, Wind and Waves is within easy walking distance of groceries, amenities and restaurants including The Drake, East & Main Bistro and the Stache piano bar. Suitable for families, couples getaways and low-key girls' weekends. A short drive or bike to area wineries and the golf course, you can either stay in or choose from a number of incredible County experiences moments away. This fully renovated 4 bedroom, 2 bathroom Century waterfront home will easily accommodate your group of 8 guests whether for a week or a weekend. Outside enjoy meals or a beverage on the newly renovated deck with Gas BBQ seating up to 8 or a play a game of soccer with the kids. Bring your bocce or badminton setup and while away the hours. A wagon is provided to transport whatever you need down to the water if you would like a lakeside picnic. In addition there is a double sofa bed in the sunroom for weekend stays or a short stay during weeklong bookings. Please ASK for guests over 8. Bed and bath linens are supplied. All the basic comforts are provided so that you can just show up and relax. Amenities include Central Air Conditioning, Wifi Internet, Satellite TV etc. Please see Amenities tab for more. Access to the waterfront is by stairs to the lake. Keep in mind that Lake Ontario is more suitable for experienced swimmers. However, there is a public beach and amazing kid’s play ground on the water in Wellington within walking distance or drive 15 minutes to North Beach or 20-25 minutes to Sandbanks sandy beaches. Pet-friendly for small dogs for $50 per dog per stay. Max. 2. One of two properties we represent that allows cats. Please ASK. Fantastic property in a great location. Everything as described, perfect weekend away. 5 minute walk to Drake Devonshire, LCBO and grocery store! A beautiful home, a stunning view and everything one could want for a relaxing vacation. Beautiful home and property! We had the best time at this place! There were 8 of us for a bachelorette and the Home was beautifully renovated and had everything we could ever need. What a view from the sunroom! Very spacious and lots of room for hanging out. Would highly recommend to anyone with a group of 8! We had a great long weekend at this house! The house was very clean and nicely set up, and the location was absolutely perfect- a five minute walk in to town for farmers markets, restaurants, etc. It was so gorgeous overlooking the lake, and fun to have a huge yard for activities! The host was very responsive and easy to contact. Overall would highly recommend for a group get away to the county! Galen's place was beautiful and just as described. The bathrooms and property is very well maintained and clean. The property itself is huge, with a massive backyard right off the water. It was a short 5 min walk to nearby restaurants including the Drake Devonshire Inn and very close to nearby wineries. I came here with my wife and both sets of our parents and we cooked dinner each night, and the kitchen was well stocked and well equipped for anything we needed. Thanks again for such a wonderful stay! We enjoyed our stay so much! It was just perfect for our family. We would like to book it again next year! The house is beautiful and easily accommodated our large group of four adults and five children. The kitchen is very well stocked, it was easy to prepare large family meals everyday we were there, there are lots of pots and pans, cutlery, dishes and glasses. The location is fantastic, the kids loved playing on the large lawn and running down to the water where we had great bonfires. We also walked into town on Saturday morning to the Farmer's Market and enjoyed delicious goodies and played at the adjacent playground. The Moms escaped to a yoga class and wine tasting at a local vineyard, which was so relaxing and enjoyable. Altogether a fabulous Labour Day weekend was had by all, we can't wait to return! My family and I stayed at the Wind & Waves cottage in Wellington last week, returning on Sunday, July 9th. We Loved it! It was clean, efficient, and it suited us perfectly. We had our grandchildren with us and they thoroughly enjoyed themselves. We enjoyed walking into Wellington to its excellent park and we biked on the Millennium trail that was just across the street. We will book for next year. Pets Allowed: Pet-friendly for small dogs and cats for $50 per dog per stay. Max. 2 pets. Please ASK and let us know breed. Wellington Beach is on the other side of town. North Beach 15 minutes north and Sandbanks 20-25 minutes South east. It is a 5 minute walk to the Drake-Devonshire Inn and East & Main Bistro. Very close to many VQA Wineries.